Margaret Tobin Brown, is a woman who can easily be defined as “beyond her years”. Her attitudes, thought process’ and motivations all seem to fall in line w ith a modern way of thinking, so to place her at the turn of the 20th century, truly highlights how radical her thinking was. Margaret was no stranger to voicing an opinion, particularly when she believed an injustice was taking place. Here at the Molly Brown House Museum we are responsible for sustaining Margaret’s legacy, doing that, particularly in the modern socio-political climate, we often find ourselves asking (and being asked by guests), “What Would Margaret Do?” In the face of adversity, Margaret never backed down from what she truly believed was right, and that is something to be honored; however, where that gets tricky is….Margaret doesn’t live in modern times, and she didn’t have a crystal ball to look into to see what Denver may transform into in the coming years, so, she never truly left an opinion on particular stances. While we all would like to think that Margaret would take a stand against some actions that are currently happening, or that Denver and the country had grappled with in the past, we honestly don’t know! And any answer that we provide, would really just be a projection of our own personal feelings, dependent entirely on who exactly you ask here at the house. What we do know, is that Mrs. Brown understood that a “certain degree of wealth and education allowed a woman to take a stand against patriarchal culture, and she used those benefits to her own advantage as well as to help others politically and culturally”. In an attempt to draw a more complete picture, we invite you to come along on a blog series that explores some of the socio-political instances that were prevalent in Margaret’s life, in which she had taken an extremely vocal and public stand, to help you conclude in 2017…What Would Margaret do? Margaret Tobin was born to Irish-Catholic immigrant parents on July 18th, 1867 in Hannibal, Missouri. Hannibal was a rising star thanks to a local writer with a flair for adventure (Samuel Clemens) and the advent of the Transcontinental Railroad, but was known for its tight knit Irish Catholic community. Her father, John Tobin, emigrated to the United States after the early years of the Irish Potato Famine beginning in 1845. John Tobin settled in West Virginia on a farm with a few other family members only a few miles from Harpers Ferry; his instilled sense of right and wrong would see him be called to the cause of the abolitionists. He joined with John Brown to help liberate slaves, and family tall tales even suggest that he manned a station on the Underground Railroad to help slaves escape to the North. His second wife, Johanna Collins, was born and raised in Ireland as well, echoing John’s need for justice and equality, Johanna was a proud descendent of O’Donovan Rossa, a leader in the IRA who was exiled to America. Johanna would become a regular fixture in the Irish Catholic social scene in Hannibal. Both John and Johanna instilled a fierce sense of pride for their Irish roots to their 6 children, and more so, an overwhelming belief that education for their children was important in the ability to accomplish anything in their lives, an opportunity that was not necessarily afforded to them as children. Although the Irish made up a large portion of the Hannibal community and were integral in helping to establish the town along the river, socio-economic lines had been hard set in the now booming town. The Irish were largely marginalized and tended to keep to themselves, and this ostracization kept through to World War I. Because of this, the Irish community stuck true to their roots-their Catholicism. Father O’Hanlan had arrived in Hannibal in 1848, and had become a close friend to the Tobin family, and had helped to establish the first organized Catholic parish, Immaculate Con ception Parish with Reverend Patrick Fleming in 1851. “Mrs. Brown was Irish, when Leadville saw her first, with a certain charm and frankness that went well with the face full of irregular features, and laughing blue eyes, [although] the mouth generally smiling was not altogether lacking in good qualities. There is a craze these days among folks to know what you are and from whence you came” this was an excerpt from the infamous Polly Pry, a popular gossip columnist who wrote for the Denver Post. Margaret wasn’t the only Irish person that Leadville had seen by the 1880s though; Leadville was the fastest growing city in the country at the time; rising over 10,000 feet into the air, Leadville had literally, sprang up overnight. Those who inhabited this “Cloud City” were heavily Irish, and often compared themselves to the Colorado wildflowers that would stubbornly push themselves between the rough stones: hardy, independent and determined to survive. This mass movement of a population to an extremely isolated mountain town was fueled by the discovery of one of Colorado’s most precious commodities: gold. The City of Leadville had quickly become an Irish town, those that had moved here held on tight to their Irish characteristics, and insisted on being called Irish. The city began to adopt Irish ideals and celebrations tended to center on the Irish Annunciation Church, for weddings, baptisms, Irish wakes and of course, Saint Patrick’s Day became a significant even yearly in Leadville, which still continues onto this day, with a day full of revelry and a parade! In 1893, the lives of the Browns would change drastically. J.J. Brown has been rewarded for his creative engineering, and was given ownership in the Little Jonny Mine, a mine that would reveal itself to hold the largest vein of gold in North America. The Browns became millionaires overnight. Despite the Irish community in Leadville that they had entrenched themselves in, they decided to move off of the mountain and into the Queen City of the Plains, and purchased a modest family home on Pennsylvania, in the newly adopted Capitol Hill neighborhood of Denver. The myth of Margaret tells us that she wasn’t initially accepted into Denver’s high society, and while portions of that are correct, money can overcome almost any character flaw….even if it is “new money”. Margaret was often viewed as the small town girl in the big city, however, she was a woman who not only prided herself on her ability to adapt to any situation, but believed that an educated woman was a woman who could accomplish anything. With her newly amassed wealth, she invested in herself, her children and the communities in which she found herself a part of. She was rapidly finding herself sitting in the parlors of some of Denver’s most well known socialites, being fitted for ornate dresses from French designers and ruffling a few feathers of what some considered proper behavior for a woman of her stature. The common thread through this transition however, was her belief that your background and circumstances don’t necessarily dictate the rest of your life. Never far from her thoughts, was the reminder that she was not born into this social lifestyle; she came from a line of immigrants who had given up everything so that she could live the life that she had dreamed for herself. She knew the struggles that her parents had faced upon their arrival to America; the 19th century was not a very welcoming place for many immigrants, but for the Irish in particular. It is with this background, that Margaret would see herself become the flag bearer for not only Irish rights, but immigrant welfare in general. The Great Hunger had forced many Irish to abandon their tenant farms in the old country and brace for a new start in the land of dreams. This mass exodus of Irish from their homeland was multidimensional; The Great Hunger was more than the potato blight that caused the Irish Potato Famine, it was coupled with a strong ruling hand from the British, who deprived the Catholic Irish the ability to worship freely, vote, speak their native tongue in their native land or own land. The British had imposed a pattern of rule that included tenant farming, forcing the Irish to farm the land they live on to not only have to pay the rent for it, but to continue to see all the wheat, barley and oats they tediously grew be exported back to England, while they starved, quite literally to death, in Ireland. The plight of the Irish was greatly ignored, Charles A. Trevelyan who was in charge of relief efforts in Ireland, was quoted as saying in the Illustrated London News of March 1849 that, “the judgement of God sent the calamity to teach the Irish a lesson, that calamity must not be too much mitigated.” Nearly 1 million people perished, another 2 million abandoned the lands in which their heritage was rooted, in search of a new hope and a new life. The Irish arrived in America, if they survived on the “coffin ships”, not yearning to breathe free, but simply, to eat. Many spent their life savings on passage to America, scores never making it further than the docks they arrived on. These fresh immigrants arrived to a tumultuous America, that wasn’t sure how they felt about the influx of the Irish. The Bible Riots a few years earlier in 1844, saw anti-Irish, anti-Catholic mobs in Philadelphia burn churches, houses, and followers as a sign that they were unwelcomed. Many Nativist Americans at the time had believed that Ireland wasn’t sending their best, their brightest, that they were sending over uneducated, unskilled workers, looking to leach benefits from the United States. The Irish were hardly alone though in their mis-treatment upon arrival, the Germans had been widely vilified in the decades before, and this anti-catholic feeling was hardly new. Remember, Puritans had made their way across the Atlantic from England nearly 100 years earlier to escape the papism that they believed was infiltrating their homeland. The Irish weren’t above doing hard labor, the work that many “natives” saw as below them; so, they dug the trenches and canals, they built the bridges, they laid the railroad tracks, they slaved away in dangerous textile mills, worked on the docks, and were hired out to work in the stables. In some parts of the country, African Americans and Irish were often found on the same social tier. But, they were grateful to have a job, and to finally be able to provide for their families of their own accord, rather than under the thumb of a British landlord. Quickly, Nativists, began to view the Irish as a threat, stealing the jobs that they didn’t want in the first place. Signs reading “Irish Need Not Apply” began appearing in windows. As a nation, we began by declaring that ‘all men are created equal.’ We now practically read it ‘all men are created equal, except negroes.’ When the Know-Nothings [political party] get control, it will read ‘all men are created equal, except negroes and foreigners and Catholics.’ When it comes to this I should prefer emigrating to some country where they make no pretense of loving liberty—to Russia, for instance, where despotism can be taken pure, and without the base alloy of hypocrisy. The effects of the Irish backlash could be felt back in Colorado as well. By 1870, 60% of the Irish men in Colorado were laborers, with 70% of the Irish women in the state were earning a living as a domestic servants. For Margaret, and the rest of the Brown family, Colorado was often considered an open and welcoming state. Colorado has had a multicultural base for years, openly welcoming in freed slaves like Clara Brown (no relation) from Kansas, the Chinese both in the mines and to help built the Denver infrastructure, and of course, the Irish. The wealth that the Brown’s had been able to amass, helped Margaret with her true passions….equality. Her unabashed desire to speak for those whose voices have been silenced, or to stand up to social injustices, was greatly advanced by her financial ability and social standing. It’s no surprise, that the plight of the Irish had a pull on Margaret’s heart. The largest visual representation of Margaret’s passion for equality can be traced back to one of Capitol Hill’s most iconic buildings, the Cathedral Basilica of Immaculate Conception. The initial funding for one of the United State’s only basilicas came from a fellow Irish immigrant, whose family had fled the Great Hunger decades earlier just as Margaret and J.J.’s family did, J.K. Mullen. Mr. Mullen has had a significant impact on Denver as a whole and the Irish Catholic community in general. Along with fellow funder J.J. Brown, construction began on the crown jewel of Colfax. Together with the Immaculate Conception Cathedral Association, the men raised $28,000, enough to purchase 8 lots where Colfax and Logan intersect. The goal? To build a church whose spires would reach to the sky, with a watchful eye over the city that had only been established 25 years earlier. An elaborate groundbreaking ceremony was held in 1902, however, by 1906 little more had been done to the cathedral than a laid foundation. The frustration that Margaret must have had, a beautiful cathedral-two blocks from her House of Lions, built for the express interest of the burgeoning Irish Catholic community in Denver….sitting stagnant. Even with her own husband on the board! It didn’t take long for her to spring into action. Margaret was unanimously nominated to head the fundraising assembly; seeing as Mrs. Brown was never afraid to pressure her wealthy friends for funds to help the community, she gladly accepted as the word ‘fail’ had long ago disappeared from her vocabulary. Always cognisant of the state of the community she had found herself in, she was aware of the increasing backlash to various cultural groups within her community. She had dreamed up a grand idea, she would hold a Carnival of Nations, influenced by her travels to the Chicago Columbian Exposition in 1893, the St. Louis World’s Fair in 1904, and her love for the melting pot that the Nation, and state, supports itself on. Her dream, was to have as many nationalities represented at her fair than at any other fundraiser in Colorado’s history. Her pure determination to succeed, and her unabashed willingness to cross various cultural and societal lines, helped fulfill her desires. She was still obviously very proud to be not only Irish, but to be an immigrant whose family had helped contribute to the American dream of the United States. The Irish had become one of the largest, wealthiest and most influential ethnic groups in the Denver area. The Irish Village at the Carnival of Nations was the only village that was exclusively controlled by the culture that it was representing, “the village features romanticized evocations of a rural Catholic Ireland, and was a far cry from the poverty and political turmoil that gripped the nation.” Because she was no stranger to controversy, she didn’t stray away from inviting groups to participate that had been treated unfairly in Denver’s current society: Native Americans and Chinese. The villages of the First Nations had become some of the most popular, historian Modupe Labode wrote in an article, “the popularity of these exhibitions was perhaps fueled by the feeling of superiority and triumph the audience enjoyed as it gazed at people who, only three or four decades earlier, had controlled the land they now stood on. In these villages and exhibitions, visitors could safely observe a vanquished foe.” Some believe that this was the mustard seed that started a popular myth of the Brown family on Pennsylvania. Stories had begun to circulate after the Carnival that Margaret had actually invited an entire Ute tribe to camp on her front lawn, a gesture that some believe had permanently alienated J.J.’s affections, and helped lead to their separation. Interestingly enough, although J.J. was an Irish immigrant himself, we have no evidence that he carried Margaret’s passions to the same extent. We casually joke around the museum that for J.J., it was probably easier to let Margaret do as she pleased, rather than face the tongue lashing one would likely receive by telling her what she should be participating in. 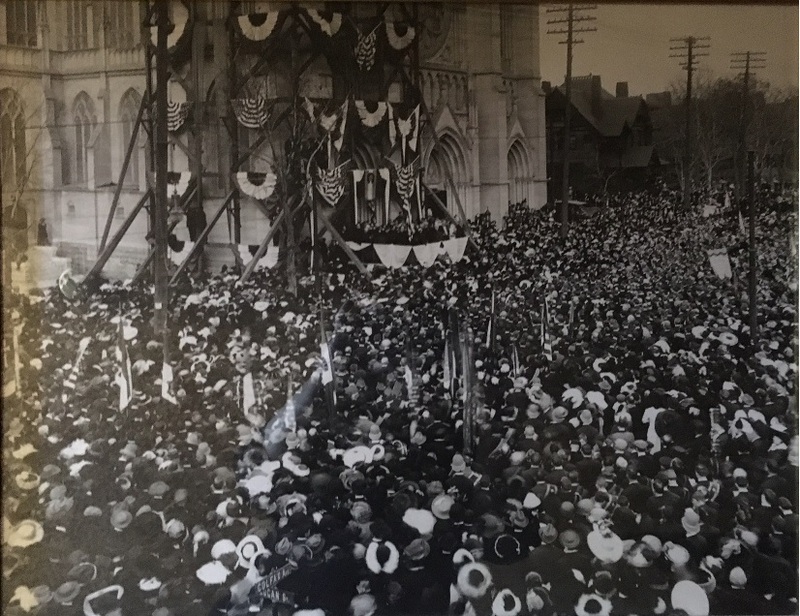 The Carnival of Nations was a success and it’s “liberal, pro-labor, multicultural approach would turn much of conservative Denver society on its ear.” The Cathedral was completed in 1912, with the first mass taking place October 27th, 1912, only 6 months after Margaret survives the sinking of the R.M.S. Titanic. A large parade was held and nearly 20,000 people descended upon Colfax, the Denver Republican noted about the parade, “the completion of Denver’s most beautiful church, and the spectacle of ten thousand souls kneeling outdoors to receive the Benediction of the Blessed Sacrament, was one never surpassed in the ecclesiastical history of the West.” Within a year, the congregation had swelled to nearly 3,500 congregants, with the Irish making up the vast majority. Margaret had been able to solidify herself as the proud Irish-Catholic that she was, and took the responsibility of representing her culture very seriously. The Brown family had become regular members of the church that they had so tirelessly helped to build, despite the personal turmoils that some believe, exasperated an already sensitive and tumultuous marriage. They devoutly attended 11am mass and continued to rent out pew 6 until they left the Denver area in later years. Margaret, never one to pass up an opportunity to show how far she had come from her humble Hannibal roots, would arrive fashionably late, in her latest fashions, with her shillelagh walking stick adorned with flowers and ribbons and saunter down the main aisle of the great cathedral she had tirelessly helped to build. With every congregant eye following her to the bench in her pew, none could deny that if not for the tireless effort, and deep connection to her roots, that the very church in which they found themselves worshipping, would cease to exist. So, what would Margaret do, in today’s socio-political climate? She was a warrior for injustices at the turn of the 20th century, however, we also know that as the Irish were more readily accepted into American society, they began to use the same vitriol against the fresh crop of immigrants arriving, for fear that they would be taking Irish jobs. Right after her death, in 1932, we began to see relations between African Americans and Whites start to come to a head. Just as “Irish Need Not Apply” signs were a common site in 1850s America, many started to believe that if an african-american was working, while a white man was not, he should be ousted; The number of lynchings in the south had jumped from 8 in 1932 to 28 the following year. Would Margaret have sprang to action against the racial injustices felt by those she didn’t have a direct connection to? While she did have servants, we do have a record that she in fact did hire people of color to work in her home. One could ask the question, does this mean that she didn’t have racial bias’ in a time where so many Americans did? In what other ways was her life integrated? Did she treat those persons of color who worked for her in the same familial way she did the servants of Irish heritage? When we fast forward in history to the farm worker labor disputes and the plight of Cesar Chavez, would Margaret have dropped everything, as she did in Ludlow, to raise up in protest with her fellow citizens for equal working rights? Or, did the passion to seek justice in Ludlow come from her history as a poor miner’s wife as well as a successful mine owner’s wife? When looking at the current political landscape, would Margaret’s passion for education and children have made her a proponent of DACA? Or, would the struggles that her own family went through, to arrive in America through the proper venues, have shaded her actions? Margaret loved to travel the world, and traveled alone as well as with members of her family regularly, often visiting far off places that many could only dream of seeing with their own eyes. Her desire and ability to go out of her way to learn the languages and customs of the world, and to use those skills to help others in ways she never could have possibly dreamed. Most of what fueled Margaret was her Irish-Catholic roots, she knew what it meant to be persecuted for no other reason than simply the religion you practice and the country in which your heritage springs. 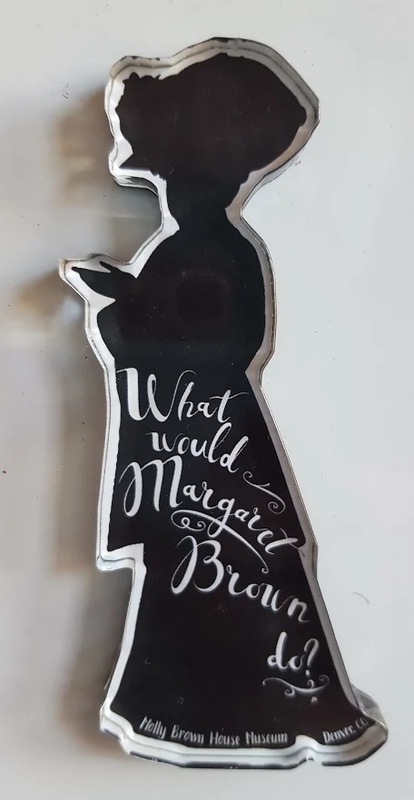 So I ask, from your scope and knowledge of her motivations and passions, What Would Margaret Do?